Family members and friends of the Former Governors’ Mansion’s past occupants still visit the site; these moments provide unique opportunities to hear behind-the-scenes stories. I’ll share a few of my favorites with you. In September 2017, a gentleman and his two children from New York visited; he wanted to show his kids where their grandmother had once lived. His son looked me in the eye and said, “I also want to see the picture of my great grandfather.” The father then explained that his mother is one of Governor William Langer’s daughters. Langer was governor from 1932-34 and from 1937-1939. As they walked around, the boy asked questions about historical events, some meant as a friendly quiz because he knew the answers. I enjoyed his spark and conversation style, which reminded me somewhat of a chess game. There was no doubt that he was the great grandson of Bill Langer. The girl, younger and not as captivated by talk of wallpaper from the 1930s, looked fondly at the piano. I welcomed her to play; the room filled with music from the same Steinway that Langer had acquired for the Mansion. 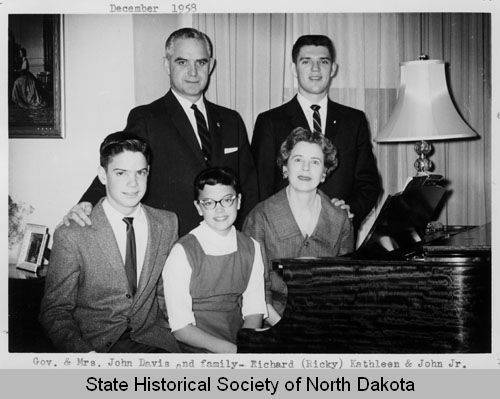 Governor and Mrs. John Davis and their children Richard, Kathleen, and John Jr., 1958. State Archives, A2528. And then there’s the story of the secret identity. As part of our augmented reality project at the Mansion, I invited John Davis, Jr. , for an interview in September 2016, and he graciously accepted. John E. Davis was the state’s 25th governor from 1957-1961. In addition to showing me photos of his father, he told a few stories about living in the Mansion. Disliking the limelight when he was a teen, John Davis, Jr., didn’t want people to know that he was the governor’s son. While attending college in Montana, he carpooled home for holidays for two years without telling his travel companions about his father. He told them to drop him off at his grandmother's house down the road, so they wouldn’t know he lived in the Mansion! Portrait of Usher L. Burdick, 1929. State Archives, B0076. Another favorite encounter was with Ruth Haugland in the summer of 2016. She introduced herself and said that she was in her eighties but did not describe—at first—her ties to North Dakota history. As we chatted, I mentioned my background in teaching. Haugland said, “My father was a teacher. 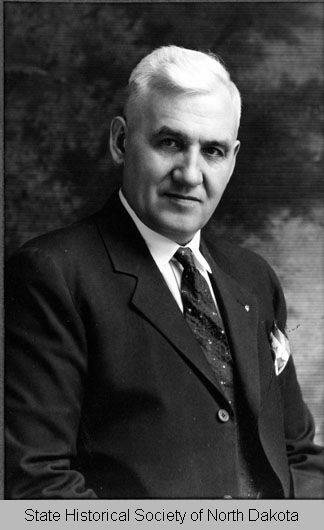 In fact, that’s how he met Usher Burdick.” Usher Burdick served in the ND House of Representatives, was lieutenant governor from 1935 to 1945, and served in the US House of Representatives from 1949 to 1959. Long before Burdick’s political career, Haugland’s father, Torger Sinness, answered a call to teach a bunch of rowdy schoolboys (including Burdick). The school, on Graham’s Island on Devil’s Lake, had lost a number of teachers who had literally run from the classroom and never returned; boys had been known to toss teachers or students out the windows! Haugland said her father walked into the classroom with a pistol in his pocket, which quickly settled the class. Although Burdick put much energy into trying to scare away Sinness (including sneaking into his bedroom one night and beating him up), the teacher stood firm and eventually became Usher’s friend, mentor, and campaign manager throughout Burdick’s political career. The next day, using the images from his dream, he climbed onto the bone shaker and left his competition far behind. Although these are brief encounters, they are the moments that breathe life into a historic site, often playing out like the “movie” in Torger Sinness’s dream. I love to see visitors’ eyes brighten at the story of the boneshaker race or a governor’s son who went to great lengths to blend in with his peers. And the story collection is growing for this interpreter who, some days, is lucky enough to catch a trip through time with the unexpected visitors who walk through our door.